رضایی, محمد رضا, رضوی, سید حسین, شبستری, سعید. (1396). بررسی مکانیزم‌های استحکام‌دهی در کامپوزیت زمینه آلومینیمی تقویت شده با ذرات آمورف Al-Cu-Ti و متراکم‌سازی شده به روش پرس در قالب زاویه‌دار. علوم و فناوری کامپوزیت, 4(2), 171-178. محمد رضا رضایی; سید حسین رضوی; سعید شبستری. "بررسی مکانیزم‌های استحکام‌دهی در کامپوزیت زمینه آلومینیمی تقویت شده با ذرات آمورف Al-Cu-Ti و متراکم‌سازی شده به روش پرس در قالب زاویه‌دار". علوم و فناوری کامپوزیت, 4, 2, 1396, 171-178. رضایی, محمد رضا, رضوی, سید حسین, شبستری, سعید. (1396). 'بررسی مکانیزم‌های استحکام‌دهی در کامپوزیت زمینه آلومینیمی تقویت شده با ذرات آمورف Al-Cu-Ti و متراکم‌سازی شده به روش پرس در قالب زاویه‌دار', علوم و فناوری کامپوزیت, 4(2), pp. 171-178. رضایی, محمد رضا, رضوی, سید حسین, شبستری, سعید. بررسی مکانیزم‌های استحکام‌دهی در کامپوزیت زمینه آلومینیمی تقویت شده با ذرات آمورف Al-Cu-Ti و متراکم‌سازی شده به روش پرس در قالب زاویه‌دار. علوم و فناوری کامپوزیت, 1396; 4(2): 171-178. 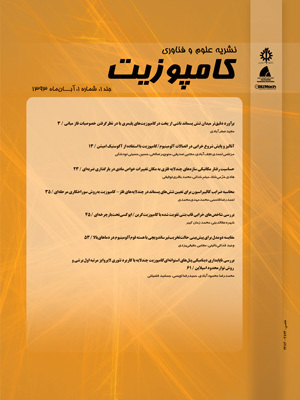 در این پژوهش از فرآیند پرس در قالب زاویه­دار (ECAP) برای ساخت کامپوزیت حجیم زمینه آلومینیمی با تقویت‌کننده‌ی ذرات آمورف Al65Cu20Ti15 استفاده شد. هدف از این پژوهش، بررسی نقش مکانیزم‌های استحکام‌دهی مختلف در تعیین استحکام نمونه‌های متراکم‌سازی شده است. به‌همین منظور، کامپوزیت حاوی 13 درصد وزنی از ذرات تقویت‌کننده آمورف تولید و رفتار مکانیکی آن با آلومینیم خالص متراکم­سازی شده در شرایط یکسان مقایسه شد. ارزیابی نقش مکانیزم‌های استحکام‌دهی در خواص مکانیکی نمونه‌ها مستلزم مشاهده و تحلیل دقیق مشخصه­های ریزساختاری و تحولات فازی رخ داده است. بنابراین، تحولات ریزساختاری توسط میکروسکوپ الکترونی روبشی نشر میدانی (FE-SEM) و آنالیز پراش پرتو ایکس (XRD) بررسی شد. همچنین، چگالی نابجایی‌های ذخیره شده در نمونه‌های مختلف با استفاده از الگوهای پراش پرتو ایکس و بهره‌گیری از روابط موجود محاسبه شد. از نرم‌افزار Clemex و روش‌های آماری برای کمی سازی مشخصات ریزساختاری بهره گرفته شد. چگالی نمونه‌های متراکم⁪سازی شده توسط روش ارشمیدس اندازه‌گیری شد. ارزیابی خواص مکانیکی نمونه­های متراکم‌سازی شده توسط آزمون فشار تک‌محوری انجام گرفت. با بررسی‌های ریزساختاری و تعیین مشخصه­های ریزساختار اعم از اندازه دانه و چگالی نابه‌جایی­های ذخیره شده، می‌توان کرنش سختی را به‌عنوان مکانیزم استحکام‌دهی اصلی در افزایش استحکام نمونه‌های متراکم‌سازی شده معرفی نمود. از طرفی، حضور عیوب ریزساختاری، سبب انحراف مقدار استحکام اندازه‌گیری شده توسط آزمون فشار تک محوری و مقدار پیش بینی شده توسط مکانیزم‌های استحکام‌دهی شد. In this study, equal channel angular pressing (ECAP) process was used to consolidate an Al-Cu-Ti metallic glass reinforced aluminum matrix composite. The role of strengthening mechanisms in the strength of developed composite was investigated. The composite with 13 wt% of amorphous reinforcements was produced and the mechanical properties were compared with pure Al specimen which consolidated in the same conditions. Precise study of microstructural features as well as phase transformations is necessary for evaluating the role of strengthening mechanisms on mechanical properties of consolidated specimens. Hence, microstructural evolutions were examined using field emission scanning electron microscopy (FE-SEM) and X-ray diffraction (XRD) method. Also, dislocations density was calculated through equations based on the characteristics of crystalline peaks in XRD patterns. Clemex software was also used to quantify the constituents of microstructures. The densities of the consolidated samples were measured by Archimedes method. Uniaxial compression test was utilized to determine the mechanical properties. Microstructural studies and assessment of microstructural features such as grain size and stored dislocations density revealed that strain hardening mechanism play the major role in the strengthening of consolidated specimens. On the other hand, presence of microstructural defects led to some discrepancies between measured and anticipated strength. Lloyd, D. J., “Particles Reinforced Aluminum and Magnesium Matrix Composites,” International Materials Reviews, Vol 39, No. 1, pp.1–23, 1994. Kainer, K. U., “Metal Matrix Composites,” First ed., WILEY-VCH Verlag GmbH & Co. KGaA, Weinheim, pp. 95, 2006. Sanderow, H. I., “ASM Handbook, Volume 7, Powder Metallurgy,” Tenth ed., ASM International, pp. 29, 1998. Jayalakshmi S. and Gupta, M., “Metallic Amorphous Alloy Reinforcements in Light Metal Matrices,” SpringerBriefs in Materials, Springer, New York, pp. 2, 2015. Polmear, I. J., “Light Alloys,” Fourth edition, Elsevier, Oxford, p. 384, 2006. Yang, Q. Zhang, Y. Zhang, H. Zheng, R. Xiao, W. and Ma, C., “Fabrication of Al-Based Composites Reinforced With In Situ Devitrified Al84Ni8.4Y4.8La1.8Co1 Particles By Hot Pressing Consolidation,” Journal of Alloys and Compounds, Vol. 648, pp. 382-388, 2015. Lee, M.H. Kim, J.H. Park, J.S. Kim, J.C. Kim, W.T. and Kim, D.H., “Fabrication of Ni–Nb–Ta Metallic Glass Reinforced Al-Based Alloy Matrix Composites by Infiltration Casting Process,” Scripta Materialia, Vol. 50, pp. 1367-1371, 2004. Dudina, D.V. Georgarakis, K. Aljerf, M. Li, Y. Braccini, M. Yavari, A. R. and Inoue, A., “Cu-Based Metallic Glass Particle Additions To Significantly Improve Overall Compressive Properties Of An Al Alloy,” Composites: Part A, Vo. 41, pp. 1551-1557, 2010. Inoue, A., “Stabilization of Metallic Supercooled Liquid and Bulk Amorphous Alloys,” Acta Materialia, Vol. 48, No. 1, pp. 279-306, 2000. Ashby, M.F. and Greer, A.L., “Metallic Glasses As Structural Materials,” Scripta Materialia, Vol. 54, No. 3, pp. 321-326, 2006. Yavari, A. R., “A New Order for Metallic Glasses,” Nature, Vol. 439, No. 70-75, pp. 405-406, 2006. Yu, P. Zhang, L.C. Zhang, W.Y. Dasa, J. Kim, K.B. and Eckert, J., “Interfacial Reaction During the Fabrication of Ni60Nb40 Metallic Glass Particles-Reinforced Al Based MMCs,” Materials Science and Engineering A, Vol. 444, pp. 206-213, 2007. Lui, E. Xu, W. Wu, X. and Xia, K., “Multiscale two-phase Ti–Al with high strength and plasticity through consolidation of particles by severe plastic deformation,” Scripta Materialia, Vol. 65, pp. 711-714, 2011. Darling, K.A. Tschopp, M.A. Guduru, R.K. Yin, W.H. Wei, Q. and Kecskes, L.J., “Microstructure and Mechanical Properties of Bulk Nanostructured Cu–Ta Alloys Consolidated by Equal Channel Angular Extrusion,” Acta Materialia, Vol. 76, pp. 168-185, 2014. Rezaei, M.R. Razavi, S.H. and Shabestari, S.G., “Development of a Novel Al-Cu-Ti Metallic Glass Reinforced Al Matrix Composite Consolidated Through Equal Channel Angular Pressing (ECAP), ” Journal of Alloys and Compounds, Vol. 673, pp. 17-27, 2016. Williamson, G.K. and Hall, W.H., “X-ray Line Broadening From Filed Aluminium And Wolfram,”Acta Metallurgica, Vol. 1, pp. 22-31, 1953. Farshidi, M.H. Kazeminezhad, M. and Miyamoto, H., “Severe Plastic Deformation of 6061 Aluminum Alloy Tube With Pre And Post Heat Treatments,” Materials Science and Engineering A, Vol. 563, pp. 60-67, 2013. Humphreys, F.J., “Recrystallization and Related Annealing Phenomena,” Second ed., Elsevier, Oxford, pp. 14-15, 2004. Bratov, V. and Borodin, E.N., “Comparison of Dislocation Density Based Approaches for Prediction Of Defect Structure Evolution In Aluminium And Copper Processed by ECAP,” Materials Science and Engineering A, Vol. 631, pp. 10-17, 2015. Jamaati, R. Toroghinejad, M.R. Dutkiewicz, J. and Szpunar, J.A., “Investigation of Nanostructured Al/Al2O3 Composite Produced By Accumulative Roll Bonding Process,” Materials & Design, Vol. 35, pp. 37-42, 2012. Kim, H. and Seop, N.B., “Prediction of Temperature Rise in Equal Channel Angular Pressing,” Materials Transactions, Vol. 42, pp. 536-538, 2001. Pei, Q.X. Hu, B.H. Lu, C. and Wang, Y.Y., “A Finite Element Study Of The Temperature Rise During Equal Channel Angular Pressing,” Scripta Materialia, Vol. 49, pp. 303-308, 2003. Seop, H. Kim, P.Q. Seo, M. H. Hong, S.I. Baik, K.H. and Nghiep, D.M., “Process Modelling of Equal Channel Angular Pressing for Ultrafine Grained Materials,” Materials Transactions, Vol. 45, pp. 2172-2176, 2004. Jamaati, R. Amirkhanlou, S. Toroghinejad, M.R. and Niroumand, B., “Effect of Particle Size on Microstructure and Mechanical Properties of Composites Produced By ARB Process,” Materials Science and Engineering A. Vol. 528, pp. 2143-2148, 2011. Lapovok, R. Tomus, D. and Muddle B.C., “Low-Temperature Compaction of Ti6Al4V Powder Using Equal Channel Angular Extrusion with Back Pressure.” Materials Science and Engineering A, Vol. 490, pp. 171-180, 2008. Valiev, R. Z. and Langdon, T. G., “Principles of equal-channel angular pressing as a processing tool for grain refinement,” Progress in Materials Science, Vol. 51, pp. 81-981, 2006. Valiev, R.Z. Islamgaliev, R.K. and Alexandrov, I.V., “Bulk Nanostructured Materials From Severe Plastic Deformation,” Progress in Materials Science, Vol. 45, pp. 103-189, 2000. Hansen, N., “Hall–Petch Relation And Boundary Strengthening,” Scripta Materialia, Vol. 51, pp. 801-806, 2004. Bowen, J.R. Prangnell, P.B. Juul Jensen, D. and Hansen, N., “Microstructural Parameters And Flow Stress In Al–0.13% Mg Deformed By ECAE Processing,” Materials Science and Engineering A, Vol. 387-389, pp. 235-239, 2004. Yoo, S.J. Han, S.H. and Kim, W.J., “Strength and Strain Hardening of Aluminum Matrix Composites with Randomly Dispersed Nanometer-Length Fragmented Carbon Nanotubes,” Scripta Materialia, Vol. 68, pp. 711-714, 2013. Kim, W.J. Park, I.B. and Han, S.H. “Formation of a Nanocomposite-Like Microstructure In Mg–6Al–1Zn Alloy,” Scripta Materialia, Vol. 66, pp. 590-593, 2012. Miller, W.S. and Humphreys, F.J., “Strengthening Mechanisms In Particulate Metal Matrix Composites,” Scripta Metallurgica et Materialia, Vol. 25, pp. 33-38, 1991. Wang, Z. Prashanth, K.G. Scudino, S. Chaubey, A.K. Sordelet, D.J. and Zhang, W.W., “Tensile Properties of Al Matrix Composites Reinforced with in Situ Devitrified Al84Gd6Ni7Co3 Glassy Particles,” Journal of Alloys and Compounds, Vol. 586, pp. 419-422, 2014.